Four men aged 42, 35, 33 and 30 are due to appear in court tomorrow charged with attempted murder and grievous bodily harm. 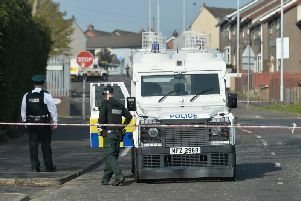 The charges follow the arrests of the four men yesterday in connection with a paramilitary-style attack in the Turf Lodge area of West Belfast on Friday, September 28. All four are due to appear at Belfast Magistrates’ Court tomorrow. As is normal procedure, all charges will be reviewed by the Public Prosecution Service.